Truck Box Tool Review is sponsored by The Home Depot. I have been compensated for my time and provided with product. All ideas and opinions are my own. This post contains some affiliate links for your convenience. Click here to read my full disclosure policy. Growing up on a farm we were always fixing or maintaining something. We worked in the fields and there were a number of barns spread out around the farm, so all the tools needed to be mobile. My Dad had a little silver Mitsubishi Mighty Max truck with a truck box in it. Most of the tools were in the truck box or bed of the truck. 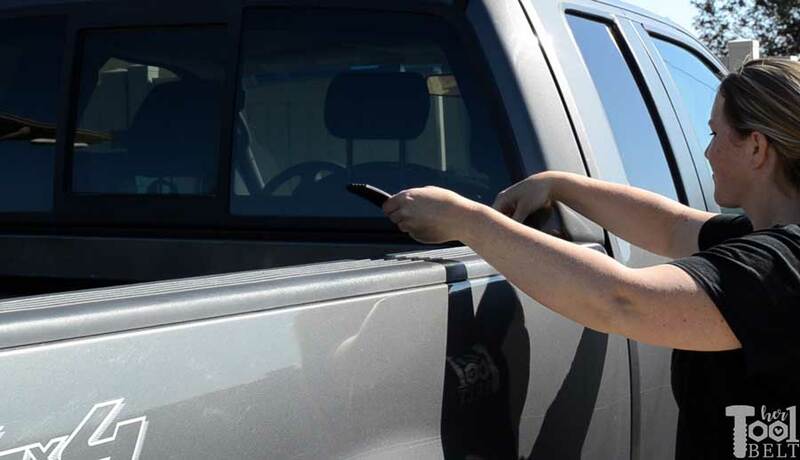 As long as you could find Dad’s truck (this was long before cellphones), then you had a pretty good chance of finding the right tool for the job. 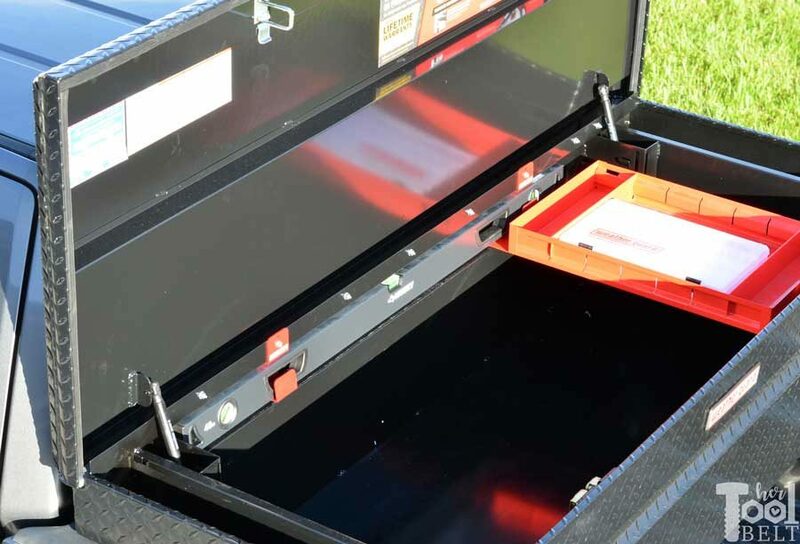 I have fond memories of that little silver mobile tool box and was excited to be able to review a truck box as part of THDprospective program. 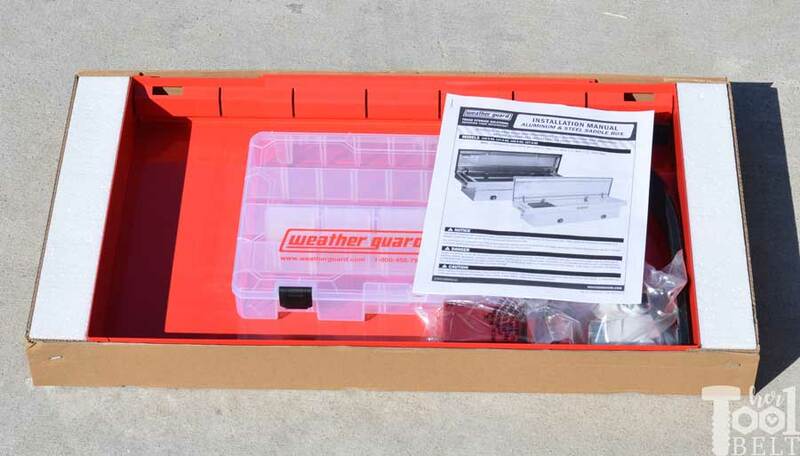 I chose the Weather Guard Full-Size Aluminum Extra Wide saddle truck box for my 2008 Ford F-150. 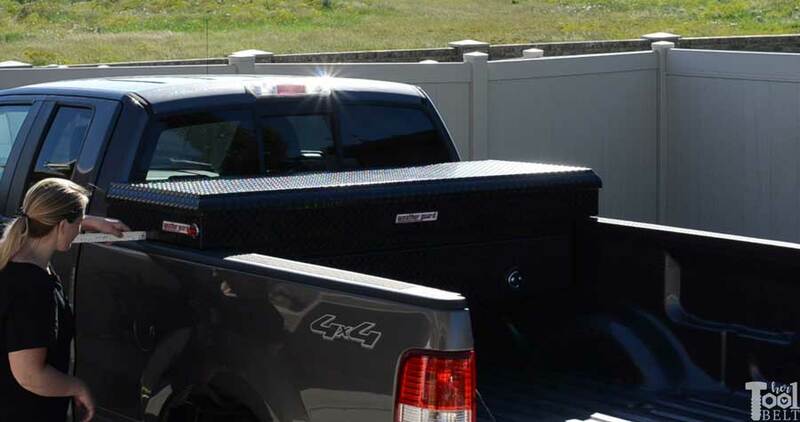 My truck is an extended cab with a standard length truck bed. IMHO the black looks pretty slick with charcoal gray paint. 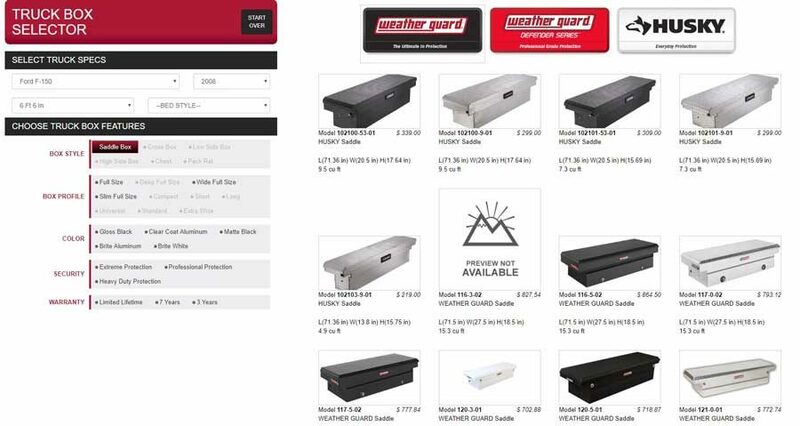 The truck box selector works really slick and helps narrow down the selection quickly. 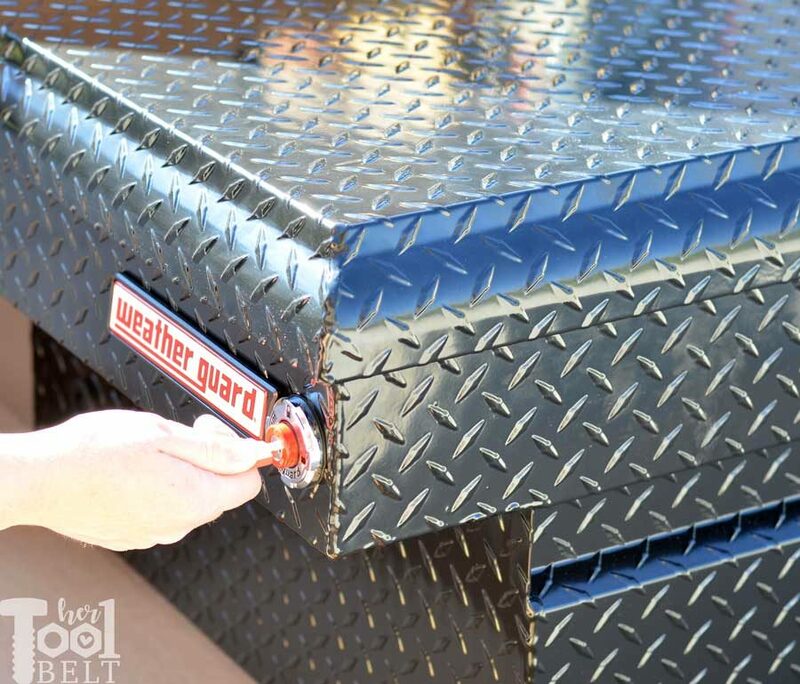 The keys to the truck box lock were attached to the weather guard sign. Simply turn the lock to unlock. Push the button to open it. 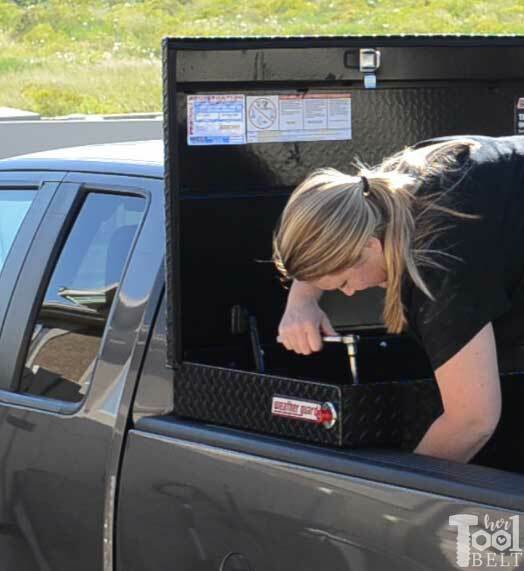 The truck box has 1-touch opening (1 button) and has automotive rotary latches and hydraulic pistons to make the lid open smoothly. 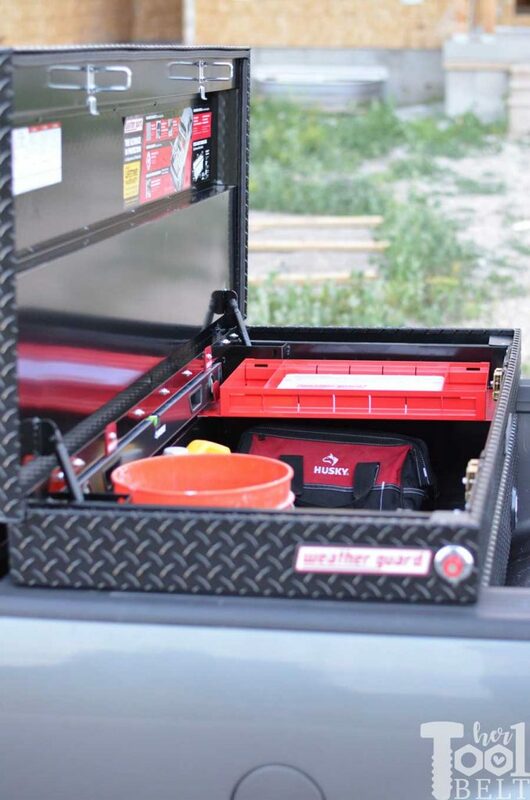 Inside the truck box is the instructions, mounting hardware, accessories and sliding tray. The inside storage area of the truck box is huge (this is the extra wide). My kids wanted to see if they could fit! Yep with room to spare. 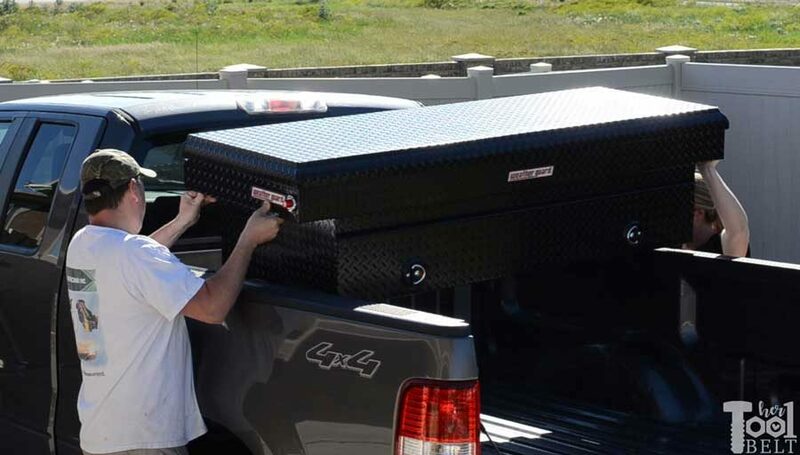 The truck box is pretty easy to install. For as big as the truck box is, it isn’t that heavy (101 lbs). Two people can lift it easily. 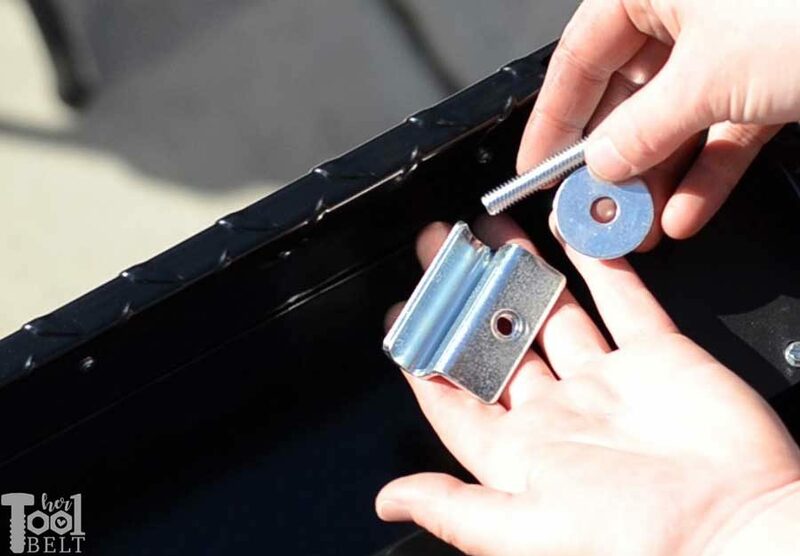 Place rubber mounting pads on truck sides. 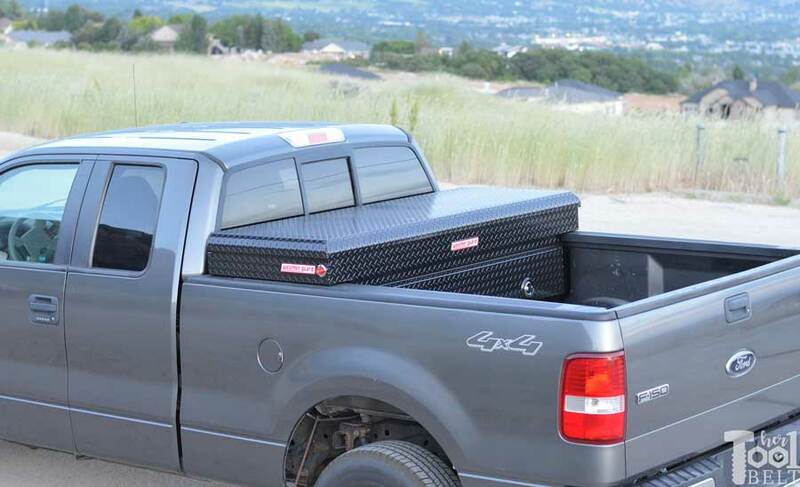 Lift and put truck box on truck sides. 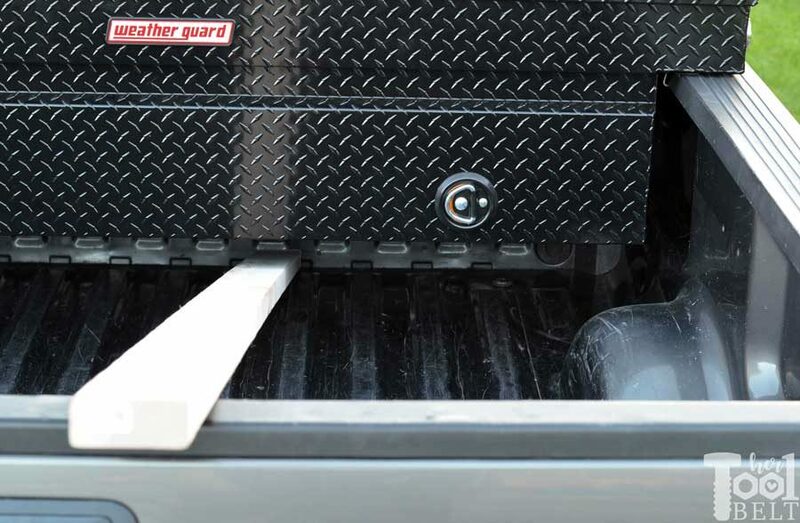 Center the truck box on the bed and open the lid to make sure you have enough clearance from the cab. 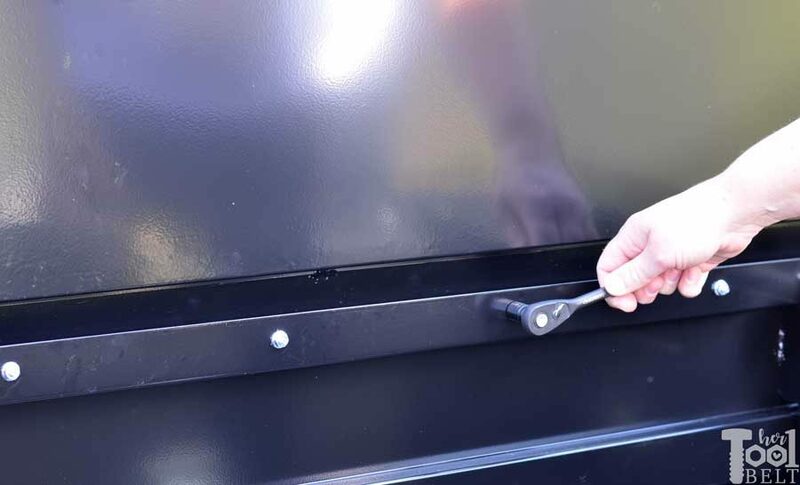 To secure the truck box to the truck, there are 4 sets of installation hardware: bolt, washer and nut plate clamp. 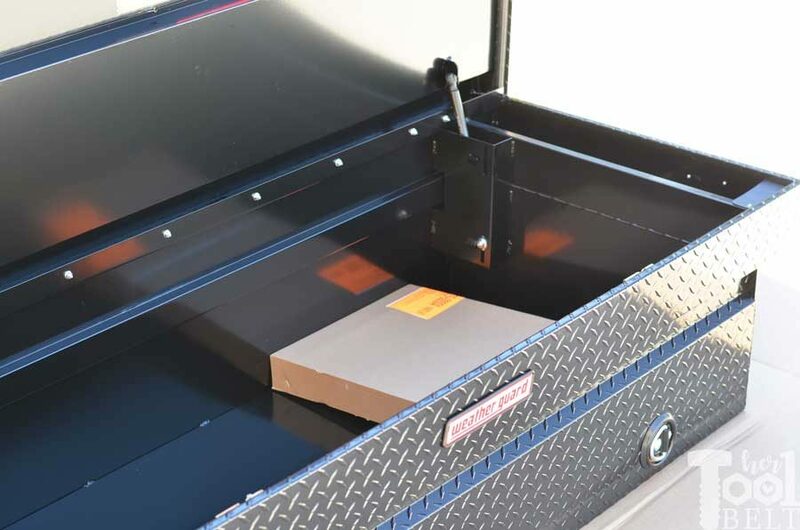 The truck box has slots, so it can clamp onto various truck dimensions. The nut and washer go down though the top, and thread into the lock nut underneath. The hardest thing about this whole installation is tightening the clamp, because you have to hold it from underneath to make sure it doesn’t spin while tightening. It does help to put a little grease on the lock nut threads. It also helped to put some wood or a spacer between the clamp and the truck box to keep it from spinning while you tightened the bolt. Using a 3/8″ socket, loosen 2 of the nuts and install the level hanger clips. Reinstall and tighten the nuts. There’s a perfect spot for a 4′ level max. It fits within a channel, so it’s out of the way. The heavy duty tray just pops onto the upper channel. You may have to flex out the truck box a little to fit it in the first time. 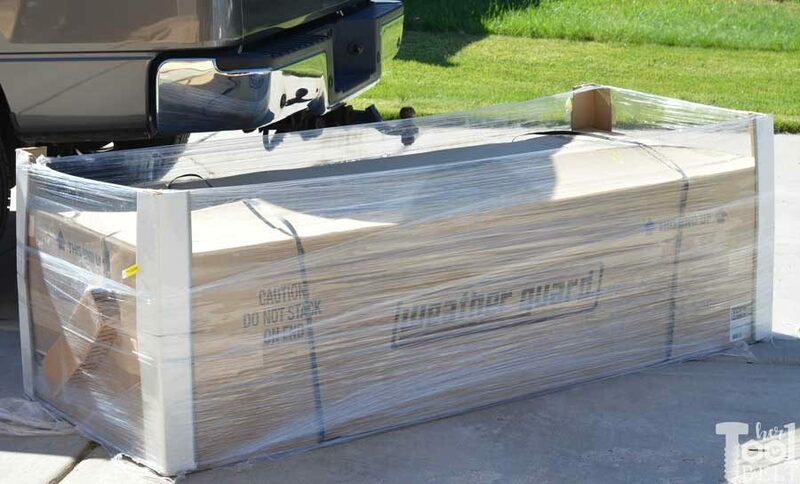 One thing I was concerned about, was whether or not I could still put lumber and sheet goods in my truck with the tailgate up. I’m happy to say that, I can! Overall I’m really happy with the Weather Guard Saddle Truck Box, the quality is really nice, it’s smooth to open the lid and closing from one side of the truck is really easy too. 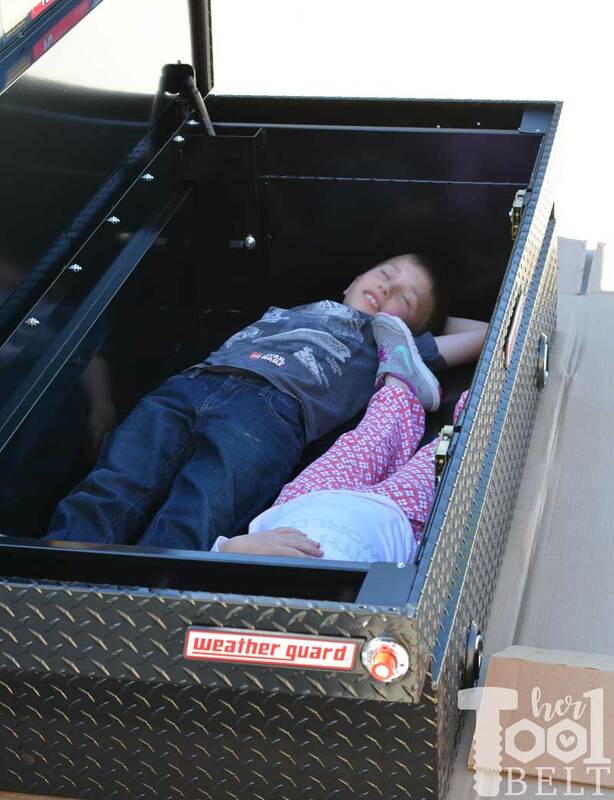 The truck box is very spacious and it has a weather seal to keep out rain and snow. 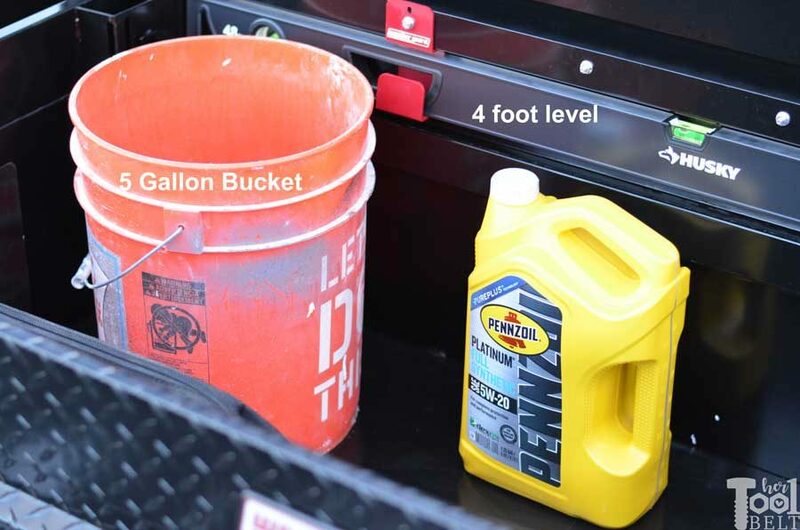 You can even put 5 gallon buckets in it. Besides hauling tools and equipment around, I’m excited to have this for camping and traveling. 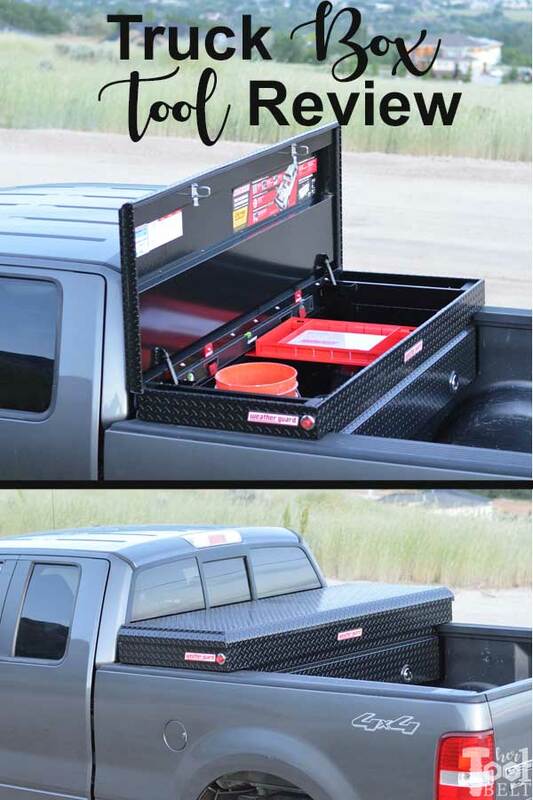 It’s a great place to securely store stuff, and it has tie down hooks in the back.